Oh, Who Are They, So Pure? Source: Edgar Pettman, ed., The Westminster Carol Book (London: Houghton & Co., 1899), Carol No. 34, p. 45. Before the throne arrayed in white? As conscious of high welcome there. From font of glace – or martyrdom. Upon their souls sin's conscious blot. But wearing there that starry crown. 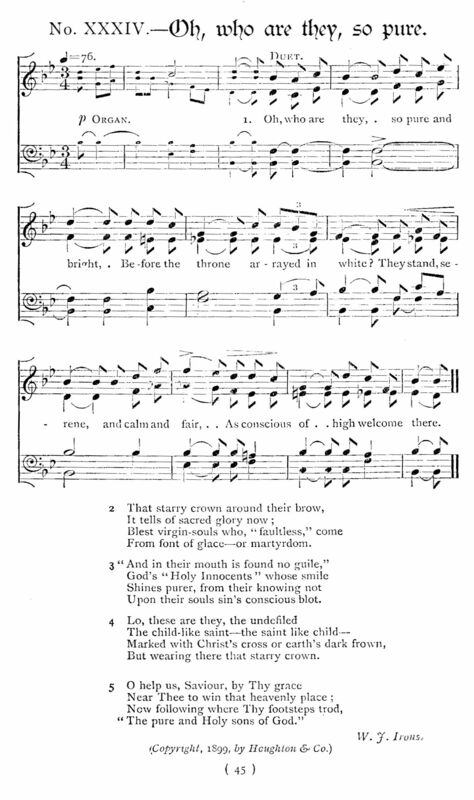 Sheet Music from Edgar Pettman, ed., The Westminster Carol Book (London: Houghton & Co., 1899), Carol No. 34, p. 45.